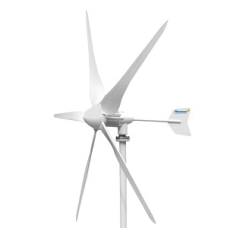 400W Wind Turbine - 12V or 24V version available. These wind generators are perfect for the use in stand-alone systems or combined with solar panels and/or hydro power. External hybrid-controller will combine wind and PV power to increase efficiency by reducing the system costs. 5 blade design with true symmetrical and twisted aerodynamic design which ensures maximum power from low wind speed and operates in low noise and minimal vibration. This concept is also using advanced electromagnetic and blade aerodynamics braking to increase reliability and safety. Patented rotor is made of high quality stainless steel rotor shaft attached with permanent neodymium magnet, the unique winding and multi pole design reduces the start-up torque. Encapsulated SKF-bearing and coated parts guarantees a long lifetime and low maintenance.